Spacefem's guild to Pokemon Go - updated! You ever watch The Guild, the Felicia Day youtube classic about a group of gamers who decided to meet IRL and realize they are VERY different? I can't believe that everyone playing Pokemon Go hasn't seen it, I was amazed, like you guys, I finally understand that whole show. But I was the only one who'd see it because of course, we have nothing in common except this game! 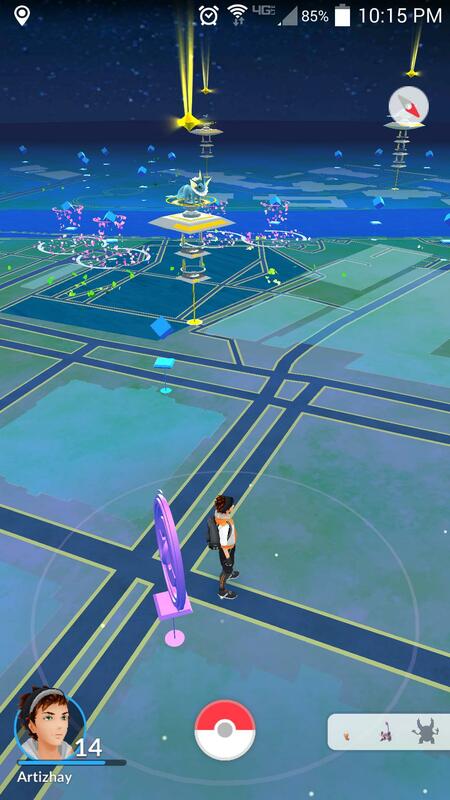 In Pokemon Go, you can take down an enemy team's level 10 gym in four minutes with the right number of people, so it makes meetups very fun. And you constantly need to know who else has trained up your team's gyms for open spots. You can't easily see where the action is around the city. So we started up chat groups using facebook messenger, and it goes like that, constantly, updates when someone finds a high up gym worth training in to. I had to turn vibrations off on my phone, the chat groups got so active, so now the notifications just show up on my screen, all day and night people taking down gyms, training up gyms, complaining about losing gyms and asking who wants to meet up to make the gym takeovers faster. I actually started playing pokemon go because I heard it brought people together and I am interested in anything that increases social capital and gets different people talking together, so I was very enthusiastic about diving into the social aspect. I picked the yellow team, Instinct, on accident, but it turns out that's a great team for social gaming because we're the minority/losing team and really need each other to make the game work. We're an odd lot, team instinct. A lady I met who I refer to as our pokemon encyclopedia said that the true fans of the game will choose instinct because we like a challenge. I didn't tell her that I picked it because the interns at work played a joke on me and said it was the cool team, and now I can't switch. Me: The totally normal one, except for my constant threats to quit the game because it's a waste of time. The pokemon encyclopedia: She's played every version of every pokemon game and has the type matchups memorized for quick access. Quote: "Finally all those hours I spent when I was ten are going for something useful!" My reply: "Useful might be stretching it... but sure. Thanks. What should I use against this pinsir again?" The older guy: Has such a high-profile job we are shocked that he plays but he goes HARD and buys the first round of drinks and most lures at the bar. Somehow has a giant fleet of dragons and will take down a level 10 enemy gym by himself, especially if he's been off on an exotic vacation and arrives home to find one we let one of his favorite gyms go. The older lady: Fitness enthusiast, nurturing, mentors the teens who want to join in. really obsessed with dragonball z. shocked that we're not. (again, differences). The transitioner: Definitely moving out of this city soon so isn't taking his job too seriously and plays until 2AM. Shares tips on avoiding nighttime security. The persistent neighborhood defender: Will take and retake the same region of gyms every night for three months. Knows which enemy team is trying to re-take because he's memorized the cars they all drive. The morning commuter: Can never go out because he's got to get his kids in bed, but he's here first with the report of what happened overnight. Retakes 3-7 low-level gyms every day on the way to work. The college student: Will go to any meetup, but will ask for a ride at the last minute. The quiet guy: Will meet you to help train up and make a spot. Has a bike in his car at all times in case the location calls for it. Forgets to mention that a gym is located in a mosquito-infested swamp because it didn't really bother him. The quiet girl: Calmly shows up in the background of meetups, doesn't say too much in chat about what's going on, but holy crap she's in EVERY gym in every corner of the damn city with a 2800 vaporeon. Enemy team posted in the city facebook group that she's got to be a guy, and we just say sure. This concludes the ten people you will need to hold a gym for a while. Assemble your team and have fun. This totally sounds like my Ingress group too :). I'm "The morning commuter" (except instead of commuting I am doing the school run. My husband is the persistent neighbourhood defender. He has ongoing feuds with various enemy players. We have additional types too, I think down to game differences. "The roadtripper" - always going on different trips to get uniques and take down new territory. Although maybe some people do that to get new Pokemon? Yeah, this reminded me so much of Ingress. And yes, there are unique pokemon, but you generally have to travel to different continents to get them. It's not like unique hacks/captures. I've met a small handful of people through pokemon, a lot more through Ingress, and it is similarly surprising, sometimes, how high-profile some of them are. An ingress player at the building next door and I have been friends for a while, and a new player showed up who worked at the same company, and we started talking, and I found out he's my friend's boss * boss * boss * boss, like division manager. That's one of those kinda weird moments. We've got some pretty competitive teams of pokemon at work too. A few of us were really surprised to find that the head of building ops actually played, and WAS REALLY GOOD AT IT TOO. For some reason even though I'm an avid player of Pokemon Go, I don't actually meet people to take down gyms. I have a small group with my sister but it's never anything official. Maybe it will pick up in summer again.